South Korea's transportation ministry has urged the country's three new budget carriers to stick to their business plans or they will lose their business licenses, industry sources said on Mar. 21, 2019. 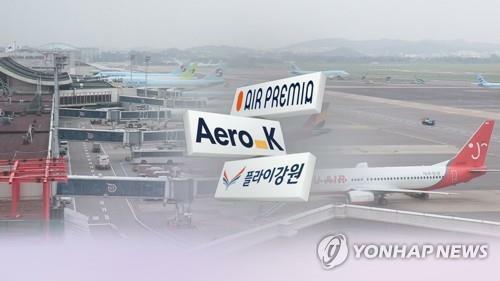 Early this month, the ministry issued business licenses to Fly Gangwon, Air Premia and Aero K, heralding fiercer competition in the already heated no-frills flight market. According to the sources, the ministry's director in charge of aviation policy met on Mar. 20, 2019 with the CEOs of the three low-cost carriers (LCCs) at the ministry in the second government complex in Sejong, central South Korea. Stressing the licenses are conditional, the director reportedly told the new LCCs to maintain thorough safety control and make business preparations. The senior official also warned that the new carriers would have their licenses revoked should they violate the business plans submitted to the ministry. Issuing the licenses, the ministry told the LCCs to meet three conditions, including a requirement to apply for an air operator certificate (AOC) from the ministry. The ministry also said it will issue licenses for flight routes to them within two years. Fly Gangwon is planning to run flights on 25 international routes to China, Japan and other nations. Aero K plans to operate flights on 11 routes connecting to nations such as China and Japan. Air Premia intends to operate medium- and long-haul routes to the United States, Canada and Vietnam. In addition, the three new LLCs were told to maintain their financial health and file their plans to hire pilots and repairmen.